It’s true — there’s a rare 1983 copper penny (specifically, a 1983-D penny) that’s worth $15,000. It’s a coin that many numismatic experts (those who study coins) still don’t fully understand — because it’s unlike any other copper penny the United States Mint has ever made. And there may be more out there just like it! What’s the story behind these rare copper Lincoln pennies and how do you know if you’ve found one in your pocket change? To understand why the 1983 copper penny is so rare, you need to know something about 1982 pennies. In the early 1980s, copper prices were rising quickly — so much so that the U.S. government was almost spending more to make the penny than its face value. In other words, taxpayers were on the verge of spending more than a penny to make a penny. Did You Know?… Metal prices have continued rising since the early 1980s, and now it costs about 1.5 cents to make each penny. This situation wasn’t exactly new. In the mid 1970s copper prices nearly doubled in over the course of less than 18 months — causing many folks to hoard copper pennies. The penny shortage and the rising cost of making pennies spurred U.S. officials to test new materials for our 1-cent coin. One of these experiments led to the creation of the 1974 aluminum penny, but that idea was scrapped after backlash from officials in the vending machine industry (who claimed aluminum pennies wouldn’t work with their equipment) and pediatricians (who were concerned swallowed aluminum pennies wouldn’t show up on X-rays). Copper prices temporarily fell, too, and the U.S. Mint shelved the idea of changing the metallic composition of the penny until a few years later, when copper prices rose once again. Following debates in Congress in 1981, the decision was made to change the composition of the penny from 95% copper and 5% zinc to 97.5% zinc and 2.5% copper in 1982. More precisely, the new pennies would be made from a nearly pure (99.2%) zinc core with an outer layer of pure copper. Production of the new zinc pennies was phased in throughout 1982, and by 1983 all pennies were supposed to be made from the new composition. Apparently there were a few copper (brass, actually — copper and zinc when combined as an alloy is known as brass) planchets, or prepared coin blanks, left behind in the coining press hoppers in 1983. Some of these brass planchets were struck as 1983 pennies! Some of these rare 1983 copper pennies were struck on planchets unlike any other copper penny the U.S. Mint has ever made. At least one 1983 copper penny, an issue made at the Denver (D) Mint, was made from a planchet identified by the Numismatic Guaranty Corporation (NGC) as 98% copper, 2% zinc — which is vastly different from the 95% copper, 5% zinc format the U.S. Mint used for decades. This rare 1983-D copper penny is likely a type of coin known as a transitional error. In other words, it’s an error coin involving unusual circumstances with its composition during a period when the U.S. Mint was changing the metal content of that coin. Numismatists are still trying to unravel the mystery of 1983-D copper penny. But here’s the good news: there are probably more out there, and you could find a 1983 copper penny in your pocket change! Copper pennies and zinc pennies may look pretty much the same at first glance, but there are some key differences that will help you tell them apart really easily. But don’t get too fixated on those exact weights. The U.S. government allows for minor variances in the weight of a new coin. These are called tolerances. In the case of the rare 1983-D copper penny, it weighs 3.0 grams — which is within the 0.13-gram (plus or minus) tolerance permitted for the traditional copper pennies. So, if you find a 1983 copper penny that weighs, say, 3.05 grams, don’t spend it thinking it’s “too light” to be a copper penny… It just might be the real McCoy! Curious how you can weigh your pennies? Buy a gram scale that can measure in increments of 1-100th of a gram. Gram scales are really cheap, and many are available for less than $20. It’s totally worth buying a scale like this so you can more easily look for rare error coins such as the 1983-D copper penny. Try the drop test. All you’ve got to do is drop your penny against a hard surface — such as a wooden table. 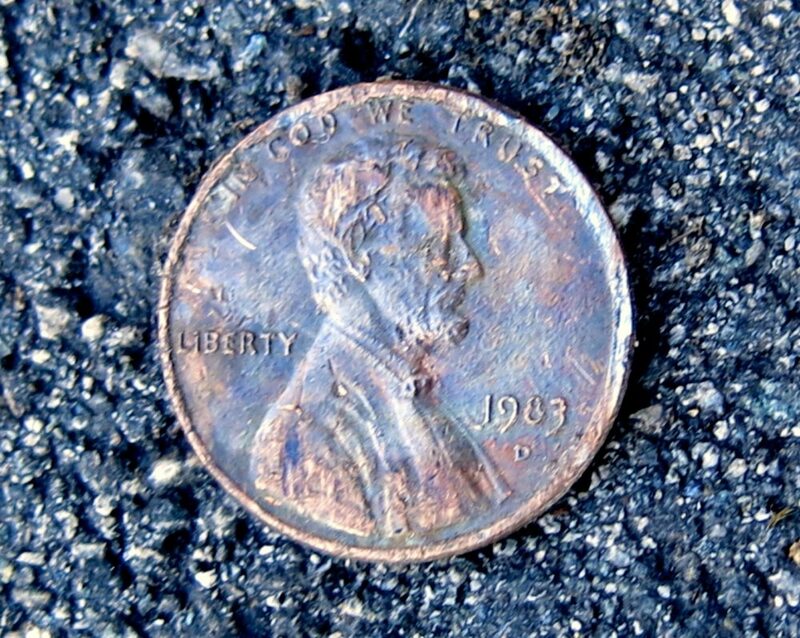 Copper pennies ring like little bells when they hit the hard surface, whereas zinc pennies make only a dull clicking sound. TIP: The penny drop test is generally foolproof, but it’s still better to weigh your pennies to really tell which ones are zinc versus copper. Hopefully you find a 1983 copper penny, but if you don’t, no worries. There are many other rare copper penny errors you can look for. 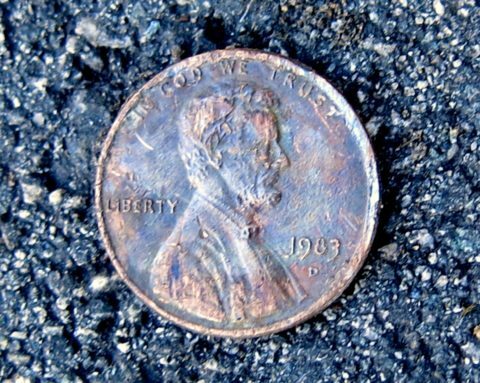 1943 copper penny — Most of these rare pennies are worth more than $100,000. 1982-D small date penny — One example that was found in spare change sold for $18,800 in August 2017. 1983 no mintmark (Philadelphia) brass penny — Examples have been sold at auctions for as much as $23,500! And there could be other rare copper penny error coins floating around that nobody has even heard about yet. Check your change — and don’t be so hasty to cast aside those post-1982 pennies as non-collectible coins!